Any way to get this to work within remote desktop? Seems to be the 1 place you would want to be able to set your location so others know exactly where you are! 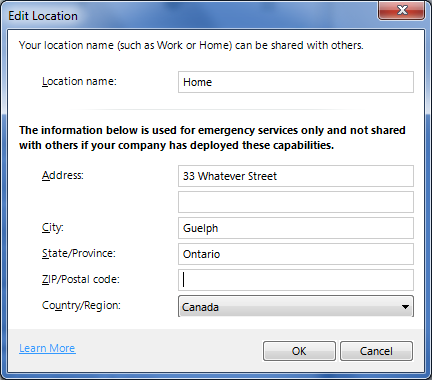 When running Lync via Remote Desktop, the reported location won't be where you actually are. 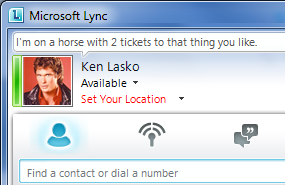 There's no way Lync can know the IP address you're connecting to the Remote Desktop from. The only way to make this work is to manually input your location. It doesn't let you manually input your location though. Option is greyed out. Feels like a massive flaw in the design. 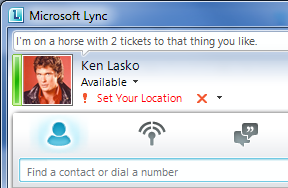 One main advantage for Lync is letting others know your availability and where you are. But how can you let people know where you are if you can't update your location when remote? The lack of an ability to set the location when RDP'd to your machine is slightly irritating. When I'm at my desk, I don't care if I can change my location. However, I RDP to my PC from various locations around the office and it would be nice to let people know NOT to page me at my desk. I have to use the status update to relay my location. 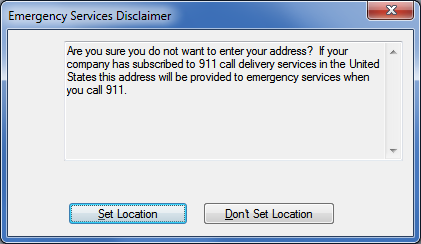 We don't use Lync as a phone, so 911 service has no bearing. It is simply a chat client/in-out board for us. The lack of support to configure the location from within an RDP session is a massive flaw. I could not agree more with the comments I read where the one time I want to set a location is when I'm remote. One can only hope that a developer at Microsoft who actually uses the product decides to change this. Ken I'm hoping you can help me out here! I'm in a situation where I have 6 seperate sites that share an IP subnet (non vpn just lucky to have Fiber!). Most users will be using soft phones, and will be moving from site to site. I'd like to pre-populate the Location database with each of my sites, and then let them Pick from those and no others. Is that possible? You can populate the location database using subnet, wireless access point MAC-addresses, switches, and even switch ports. 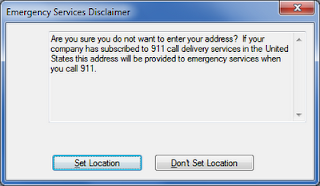 You don't have to do subnet. I have a follow-on post on the topic that outlines that.